Match is a traditional Japanese ceremonial tea created by milling specially grown, whole tea leaves into a fine powder. Match contains powerful anti-oxidants that are thought to help maintain optimal health. 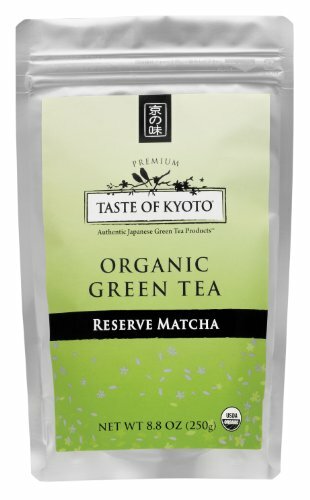 Our reserve match is the finest quality organic green tea powder available and was carefully selected for its sweet, rich flavor as well as its deep natural color. Due to its exceptional quality, this match is ideal for drinking alone as a traditional tea but can also be used for creating rich, decadent gourmet recipes. 250 grams ultra premium organic match green tea powder. Matcha is a traditional Japanese ceremonial tea created by milling specially grown, whole tea leaves into a fine powder. It contains powerful anti-oxidants that are thought to help maintain optimal health. If you have any questions about this product by Taste of Kyoto, contact us by completing and submitting the form below. If you are looking for a specif part number, please include it with your message.